"Only requires water so you'll always have the ingredients on hand." "This family-sized (56 ounce) mix is big on flavor and easy on the budget." "Tasters consistently rate it highly, thanks to the malted flour and dried buttermilk." "You simply open a pouch, empty it into a bowl, add water, and mix." "Add water, shake the container, and pour out as much as you need." "An affordable 100 percent organic pancake mix." "It promises fluffy, flavorful pancakes." "Your pancakes are guaranteed to be light and fluffy." "A favorite among consumers who like pancakes but prefer a healthier version." The Aunt Jemima brand is synonymous with breakfast and more specifically pancakes and syrup. While they have a few different pancake mixes, their complete line takes the "cake" when it comes to flavor, texture, and ease-of-use. All you need to do to make fluffy pancakes is add water and this mix will turn out delicious pancakes that can be a vessel for blueberries, whipped cream, bananas, or whatever your heart desires. Because this mix only requires water you'll always have the ingredients on hand to whip up a stack of flapjacks. Many reviewers agree this is the fluffiest pancake (or waffle) from a box that you'll get. This family-sized (56 ounce) mix is big on flavor and easy on the budget. It’s also easy to cook since all you need to add is water. The bag lists amounts for different serving sizes, so you can make more or less, depending on how hungry the family is. Not just for pancakes, this mix is extremely versatile. You’ll find recipes for everything from cookies to quickbreads on the manufacturer’s website, so desserts will be just as easy as breakfast. This is a large, money-saving quantity, but if pancakes are just an occasional treat, you can find this mix is more modest sizes as well. Stonewall Kitchen is known for its flavorful mixes, jams, and other food products, and this pancake mix is no exception. Tasters consistently rate it highly, thanks to the malted flour and dried buttermilk. This mix also requires the addition of milk, eggs, melted butter, and water, so the fresh ingredients add to the special flavor. While this isn’t the easiest or the least expensive mix, it’s great for special occasion breakfasts when you want to take the time to indulge, or it makes a great housewarming gift. This includes two 33-ounce packages, so you can open one and tuck the other in the pantry, so you’ll always be ready to make tasty pancakes or waffles. A brand that’s been making pancake mixes for many years, these might be the pancakes your mom made for you, adding the flavor of nostalgia to a mix that simply couldn’t be easier. This is a 12-pack of 7-ounce pouches that eliminates the need to measure dry ingredients. To make a batch of pancake batter, you simply open a pouch, empty it into a bowl, add water, and mix. Each pouch makes about one dozen average pancakes, so if you need to feed more people, you can simply open an extra pouch. These easy mixes are available in several different flavors that you can keep on hand, but of course, you can add your own fruit or flavorings to the basic mix any time you like. While you can certainly make small pancakes from any basic mix, the shake and pour bottle makes portioning easy since you literally add water, shake the container, and pour out as much as you need. There’s no need for a bowl, whisk, or ladle, and there’s no a lot less mess compared to trying to portion little pancakes from a bowl. The uniquely shaped bottle enhances the mixing process and offers a comfortable hand-hold while you’re pouring. All you need is butter, syrup, and a fork. This includes eight-10.6 ounce bottles, so you’ll be able to make a week’s worth of little pancakes, or two month’s worth of Sunday breakfasts. Organic doesn’t need to be crazy expensive, as this affordable 100 percent organic pancake mix proves. You’ll get 32 ounces of mix in an environmentally-friendly paper bag (like a 2-pound flour bag), so you’ll have plenty to make breakfasts and brunches. To make pancakes, you’ll need to add your own egg, water or milk, and oil, which adds to the freshness and flavor of the mix. The bag also includes a recipe for waffles, to add some variety. This should work well as a basic baking mix for any recipe that uses pancake mix as its base. Known for its wide variety of flours, baking ingredients, and baking tools, King Arthur Flour has expanded into gluten-free territory with a wide range of gluten-free ingredients as well as gluten-free mixes, like this pancake mix. It promises fluffy, flavorful pancakes, and makes about 16 four-inch pancakes per 15-ounce box. This is a pack of six, so you’ll have enough for about a week’s worth of pancakes for the family. To make pancakes, you’ll need your own eggs, milk, and butter or oil, adding to the freshness and flavor of the mix. Buttermilk pancakes are almost a universal favorite, with the slight tang of buttermilk adding a savory hint to pancakes that are likely to be drizzled with sweet maple syrup. Not only do these pancakes have dried buttermilk in the mix, but they also include several different leaveners, so your pancakes are guaranteed to be light and fluffy. To make pancakes, you’ll need your own eggs, butter, and milk or buttermilk. While this isn’t the easiest or least expensive pancake mix you’ll find, Stonewall Kitchen is known for it’s flavorful offerings, and this mix has consistently high ratings among users. While it might not be your choice for making vast quantities of pancakes on the morning after your kids’ sleepovers, it’s a great mix for a special weekend, where you want to indulge or impress. Kodiak Cakes got its few minutes of fame on Shark Tank, where they pitched their whole grain yet flavorful pancake and waffle mixes, hoping to earn a deal for money to fund the company. The sharks liked the mixes but were skeptical that the company would be a success, given the premium price compared to everyday pancake mixes, combined with a very competitive marketplace. Kodiak Cakes might have left the show empty-handed, but they believed in their product. 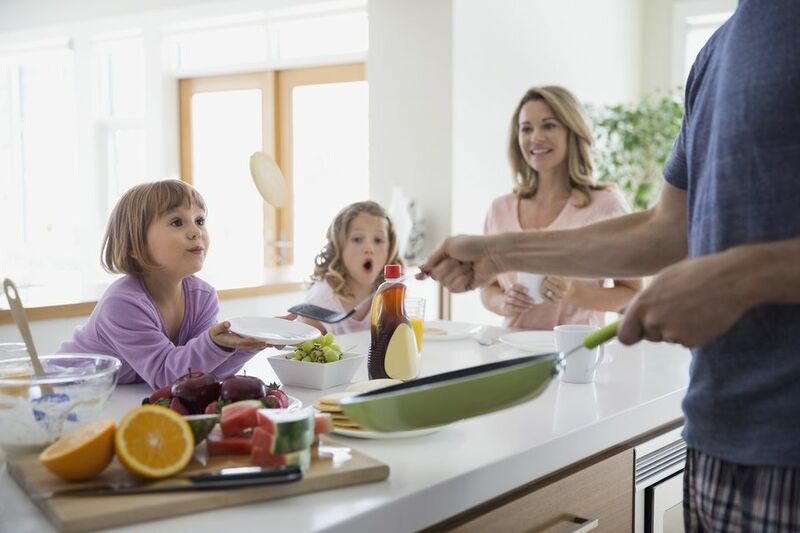 Since that television appearance they expanded the product line, grew the company, and they’ve become a favorite among consumers who like pancakes but prefer a healthier version, like this one that has whole grains as well as more protein. This mix includes both whole wheat and oat flour and can be made with just water, for morning cooking ease. For more protein, you can opt to add milk and/or eggs. Not a one-trick pony, the company touts the ability to use this mix in recipes that call for standard baking mixes, and it also offers recipes specifically created for the product.